Habit: Annual, stoloned, occasionally partly submersed. Leaf: basal, erect; stipules generally present; petioles present or not. Inflorescence: scapose; flower 1. Flower: calyx bell-shaped, lobes 5, ovate, acute; corolla radial, bell-shaped, lobes 5, adaxially sparsely papillate; stamens 4; style generally +- terminal, stigmas generally fused, head-like. Fruit: elliptic to spheric, chambers 2 proximally, 1 distally. Seed: many, minute. Habit: Tufted. Leaf: 1--3 cm, awl-like, cylindric, obtuse; stipules 0 or tapered; petiole 0. Inflorescence: pedicels < leaves, curved in fruit. Flower: calyx lobes <= tube; corolla +- 3 mm, lobes rounded, white to lavender-blue; stamens attached at 1 level; style > ovary, +- 1 mm, head-like, straight to +- curved, +- terminal. Fruit: spheric. Chromosomes: 2n=20. Ecology: Muddy or sandy intertidal flats, brackish water; Elevation: < 10 m. Bioregional Distribution: Deltaic GV (near Antioch), CCo (Abbott's Lagoon, Marin Co.); Distribution Outside California: native to eastern coast North America. Flowering Time: Apr Note: Poorly known in western North America, seeds possibly brought in with ship ballast. Citation for this treatment: Margriet Wetherwax 2012, Limosella australis, in Jepson Flora Project (eds.) Jepson eFlora, http://ucjeps.berkeley.edu/eflora/eflora_display.php?tid=31029, accessed on April 25, 2019. 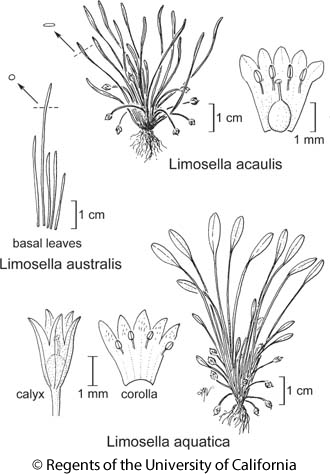 No expert verified images found for Limosella australis. Deltaic GV (near Antioch), CCo (Abbott's Lagoon, Marin Co.); Markers link to CCH specimen records. Yellow markers indicate records that may provide evidence for eFlora range revision or may have georeferencing or identification issues. Purple markers indicate specimens collected from a garden, greenhouse, or other non-wild location.